What Day Of The Week Is July 20? 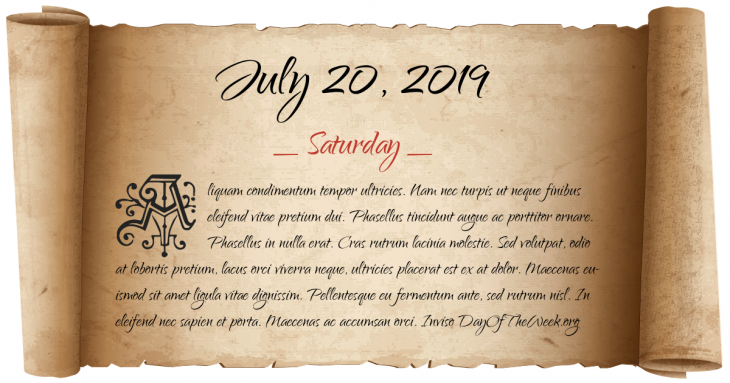 July 20, 2019 is the 201st day of the year 2019 in the Gregorian calendar. There are 164 days remaining until the end of the year. The day of the week is Saturday. First Jewish-Roman War: Siege of Jerusalem – Titus, son of emperor Vespasian, storms the Fortress of Antonia north of the Temple Mount. The Roman army is drawn into street fights with the Zealots. Wars of Scottish Independence: Fall of Stirling Castle – King Edward I of England takes the stronghold using the War Wolf. Canadian explorer Pierre Gaultier de Varennes et de La Vérendrye reaches the western shore of Lake Michigan. Citizens of Bogotá, New Granada declare independence from Spain. Denmark leaves the League of Nations. Israel and Syria sign a truce to end their nineteen-month war. The first Special Olympics is held. The American Viking 1 lander successfully lands on Mars. Johnstown, Pennsylvania is hit by a flash flood that kills eighty and causes $350 million in damage. Burma’s ruling junta puts opposition leader Daw Aung San Suu Kyi under house arrest. Who were born on July 20?